Zocalo, which loosely means “central square” in Spanish, is appropriately named. Zocalo not only occupies a prime location in The Central Place on Charlottesville’s downtown mall, it is also a central part of the city’s dining scene. Zocalo has become such a fixture, in fact, that it seems strange to imagine Charlottesville without it. It was less than nine years ago that Zocalo opened its doors in a spot formerly home to Moondance restaurant, which closed in June 2003. Yet, that seems a lifetime ago. Of course, in restaurant years, nine years is a lifetime, or several even. During Zocalo’s near decade of existence, many great restaurants have come and gone, some failing to last even half as long as Zocalo. What makes Zocalo’s long run particularly impressive is that, when it opened in 2003, it had many of the trappings of a passing trend. It had a trendy appearance – a dazzling, sprawling exposed-brick space that impressed some observers with its sheer size. It served trendy food – Nuevo Latino cuisine, that some in the business called a passing fad. And, it had trendy clientele – as The Hook observed at the time, it was the place to see and be seen, while noshing on the instantly famous Vella Jack Cheese Fritters. While crowds flocked from the start, Zocalo’s trendy trappings raised doubts about how long it would survive. Nine years later, Zocalo has not just survived. It has thrived. As confirmed by a packed house on a recent Wednesday night visit, crowds continue to flock years after Zocalo’s new car smell wore off. But, in the unforgiving business of operating a restaurant, location alone cannot guarantee survival. Even on Charlottesville’s bustling downtown mall, other restaurants have failed. So, something else must be behind Zocalo’s long record of success. The story behind Zocalo begins in 1998, when Silver met Ivan Rekosh on their first day as students at the Culinary Institute of America, widely considered the nation’s best culinary school. Silver and Rekosh discovered they had much in common. Both had grown up in the Northeast – Silver in Worcester, MA and Rekosh in Westchester, NY. Both had dropped out of college, found jobs in restaurants, and realized that working in restaurants is what they wanted to do with their lives. Both also came from homes where cooking was central to family life. While Silver and Rekosh became fast friends, they could not have realized that, a mere five years later, their friendship would spawn one of Charlottesville’s most successful restaurants. This would have been especially surprising to Silver, who had never set foot in Charlottesville. Two years later, after culinary school, the prospect of opening a restaurant together in Charlottesville seemed no less remote. Silver and Rekosh went their separate ways – Rekosh to Hawaii, where he worked at Jean Marie Josselin’s Pacific Cafe (now closed), and Silver to Atlanta, where he worked for the Buckhead Life Restaurant Group. When Rekosh had had enough of Hawaii, Silver suggested he come to Atlanta. Rekosh accepted, moved in with Silver, and found a job at the acclaimed Canoe Restaurant. Soon, Silver and Rekosh began discussing plans of opening their own restaurant. Their initial idea was to fill what they saw as a void in the Atlanta dining scene: a place for good pizza by the slice. They then learned of a possibility in Charlottesville, where Rekosh had spent time in the past because his father is a professor at The University of Virginia. From Rekosh’s time in Charlottesville, he knew Peter Castiglione, who worked at several Charlottesville restaurants. While Rekosh and Silver pondered what to do in Atlanta, Castiglione urged them to come to Charlottesville instead, to open a restaurant with Castiglione. So, Silver and Rekosh were off to Charlottesville, with little more than the hope of opening their own restaurant. When they arrived, they immediately began seeking financing for their restaurant. Meanwhile, they made ends meet with jobs at local restaurants. These were lean times. As Rekosh puts it, “what I was driving you could barely call a car.” Eventually, with Castiglione’s help, they obtained the loan they needed, and entered into a lease of their current Central Space location. They decided on Latin American cuisine for the same reason that they had once considered a pizza place in Atlanta: a void in the market. While in Atlanta, Silver had worked at an excellent Latin American restaurant, somewhat similar to Zocalo. Noting that Charlottesville had nothing like it, Silver and Rekosh sensed an opportunity. Thus, in December 2003, Zocalo was born. Fresh out of culinary school, Silver and Rekosh, who had never run their own restaurant, were about to dive head first into an industry in which three out of five restaurants don’t even last three years. Rather than a pizza-by-the-slice joint in Atlanta, the two young college drop-outs from the Northeast, with no Latin heritage of note, somehow found themselves tackling a 160 seat full service Latin American restaurant in the center of Charlottesville. Eight years later, Zocalo is going strong. While Castiglione has since moved on and opened his own restaurant, Silver and Rekosh continue to preside over what has become one of Charlottesville’s signature restaurants. So, how did they beat the odds? What has been Zocalo’s secret to success? In a word, consistency. 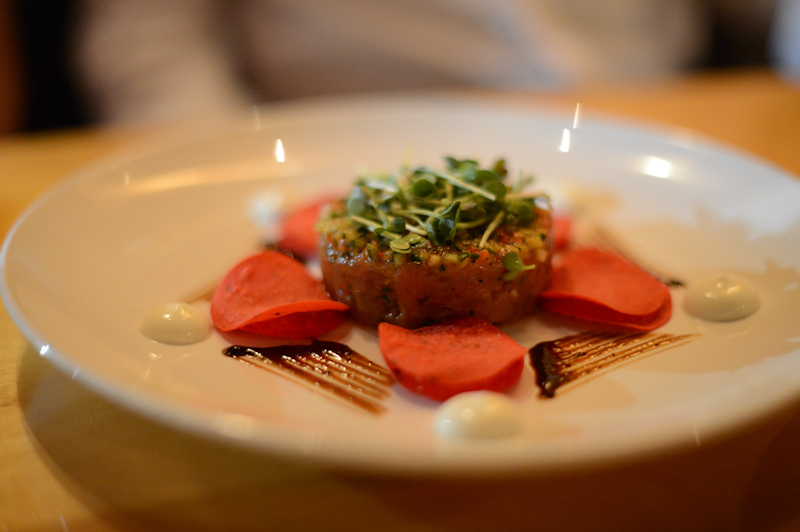 Over the last decade, no area restaurant has produced excellent food as consistently as Zocalo. Period. 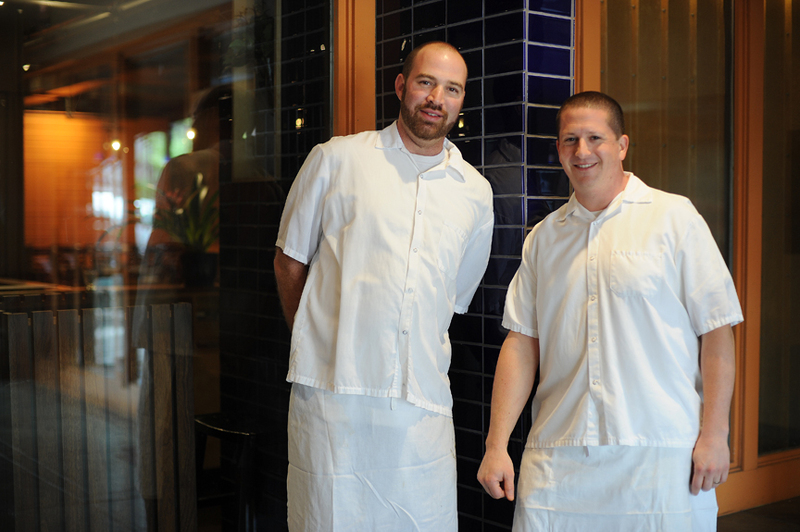 For Zocalo’s consitency, Silver and Rekosh are largely responsible. First, they treat their employees well. This breeds employee retention, which in turn breeds consistency. As sous chef Brian Ashworth puts it, the level of respect that Silver and Rekosh show employees “shows all the way to the table.” While it is customary in the industry for employees to address the kitchen executive as “Chef”, Silver and Rekosh recoil at the term, insisting on a first-name basis among all employees. Vital to Zocalo’s positive working environment is the strong friendship between Silver and Rekosh. Silver and Rekosh are close. When we tried to take a picture of Rekosh on a night when Silver was not at Zocalo, Rekosh balked, and asked our photographer to return when Rekosh and Silver could be photographed together. This has proved effective. In addition to Ashworth’s four year tenure as sous chef, Zocalo’s general manager has been there for six years, and the prep cook has been with Zocalo since day one. As Silver says, the same hands have been on Zocalo’s food since the day it opened. Silver and Rekosh gush about their cooks and staff. 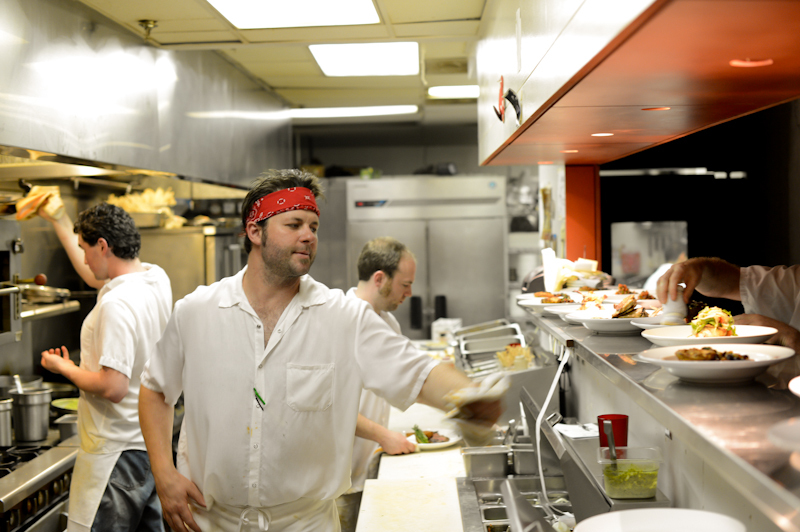 A second reason for Zocalo’s consistency is work ethic. Silver and Rekosh work hard. Rekosh recalls that, when he first decided to enter the culinary industry, his parents were less than thrilled, but told him: “if you are going to do it, be the best at it.” During the restaurant’s first several years, which Silver and Rekosh call a “blur,” they barely saw the light of day, often working from 9 a.m. until past midnight. While their hours have since become more reasonable, Rekosh and Silver still always make sure that at least one of them is at Zocalo, in the kitchen, every day. A final reason for Zocalo’s consistency is Silver and Rekosh’s deliberate focus on consistency as a goal. Not long after opening, Silver and Rekosh, who had seen the importance of consistency to the success of other restaurants, made it a central focus at Zocalo. When we spoke with them, they apologized several times for the frequency with which they used the word consistency. “There’s that word again,” they would say. Shortly before this article, we had dinner at Zocalo – just to confirm that nothing had changed from all of our previous experiences there. We were not at all surprised to find that everything was exactly as we remembered. Thankfully. Two dishes warrant special mention because they are unusually good for their kind: the chicken and the chili relleno. Chicken at restaurants can be dull, often by design to ensure there is a menu option for conservative eaters. 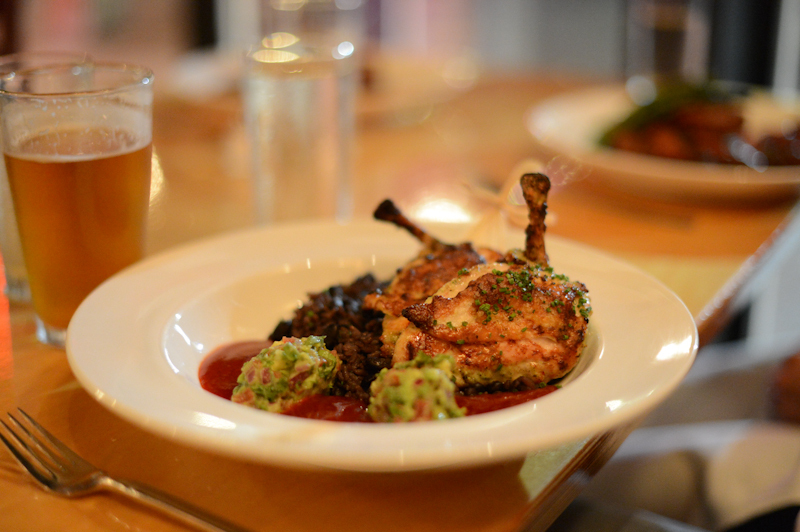 At Zocalo, though, the grilled Key Lime Free Range Chicken is a star. We spoke with one regular customer whose allergies to pork and beef have caused her to eat lots of chicken over the years. Zocalo’s grilled chicken, she says, is among the best she has ever had. We agree. Another menu option that can sometimes be a throwaway is the vegetarian entrée option. Again, at Zocalo it is a star, the black bean and corn relleno. Even devoted carnivores swoon over it. One Zocalo regular customer likes his hamburgers rare and likes his steaks cooked by having them walked slowly through a warm room. Still, at Zocalo he often orders the meat-free entrée option. That is high praise. Beyond the outstanding food, what makes Zocalo ideal for The Charlottesville 29 is that one restaurant can serve so many different purposes. Ladies’ night out. Guys’ night out. Alone at the bar for a bowl of mussels and a beer. Pre-theater drinks and snacks. A business dinner. People-watching from the patio with the kids. A romantic night out for a special occasion. Or, an extraordinary rehearsal dinner. Somehow, the atmosphere, food, and drinks at Zocalo lend themselves to all of these. If there were just 29 restaurants in Charlottesville, there is no doubt that we would want Zocalo to be one of them. A few months ago, Zocalo revised their draught list to add the world’s best beer, Bell’s Two Hearted Ale. With that move, Zocalo may have just about achieved perfection. In truth, there is not much about Zocalo we would change. But, if forced to name just one possible improvement, it would be to make off-menu specials a more frequent offering. Zocalo’s biggest strength – consistency – may also be its one flaw, if only a minor one. The Zocalo menu is very consistent. It almost never changes. In fact, many of Zocalo’s current dishes were on the menu the very day Zocalo opened back in 2003. To decide to go to Zocalo, then, is to decide to have one of the regular Zocalo menu items. If we are not in the mood for any of them, we go somewhere else. Some customers have asked Silver and Rekosh to change the menu more often. Rekosh responds that menu changes almost always upset at least some loyal customers. Zocalo has developed a regular clientele over the years, and each dish on the menu has a loyal following. The Caesar salad is a customer favorite. But, so are the steak, and the scallops, and the duck, etc. This response makes sense. Zocalo has enjoyed a long run of success without frequent menu changes. If it ain’t broke, don’t fix it. Nonetheless, even if Zocalo remains committed to a static menu, we do wonder if a compromise might be to make off-menu specials a regular part of the Zocalo experience. On occasion, Zocalo does offer specials (e.g. duck confit). And, they are often great. (See, again, duck confit.) Consistently offering specials might bring to Zocalo the one thing it lacks – the element of surprise. But, even without this change, we will be back again and again. As frustrating as that response can be, at Zocalo it is true. Everything is good. 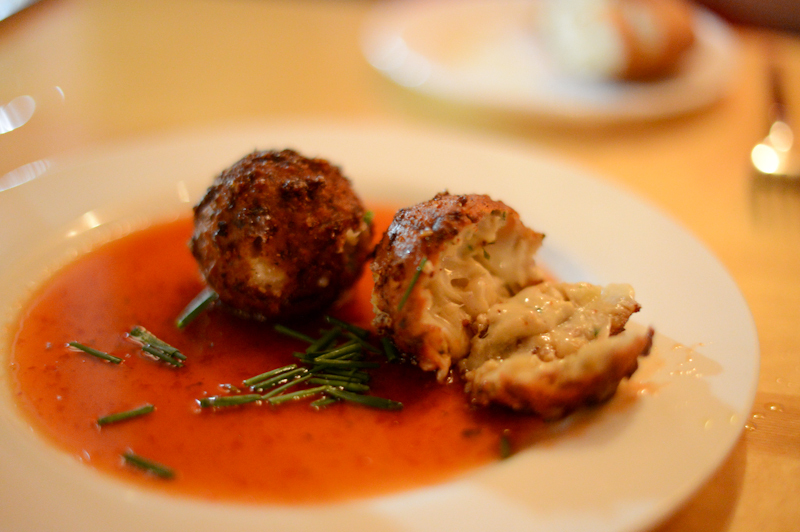 From the signature Vella Jack Cheese Fritters to the Drunken N.Y. Strip Steak, it really does just depend what we are in the mood for. But, if we had to identify stand-outs, we would name those below.